All teas are packaged and shipped in partnership with a local developmental workplace that provides employment and life skills training for members of our community with developmental disabilities. All boxes ship on the 1st business day of each month with a cut off of 6 pm cst on the last day of the previous month. 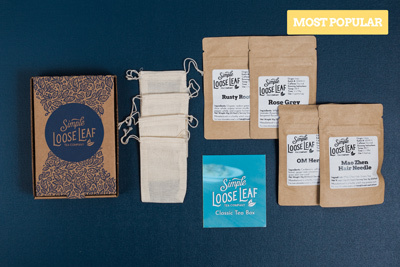 Explore the world of loose leaf tea with 4 amazing teas each month. 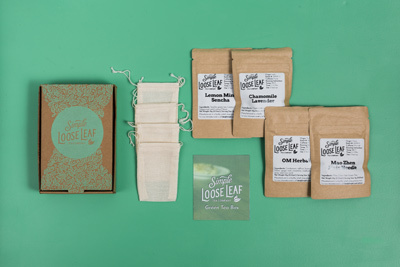 Receive a black tea, a green tea, an herbal tea, and something that captures the season we're in. 4 linen tea filters and information on each tea. Each month receive 4 herbal teas, with the occasional decaf black/green tea, that capture the joy of the season we're experiencing. All teas are 100% caffeine free! 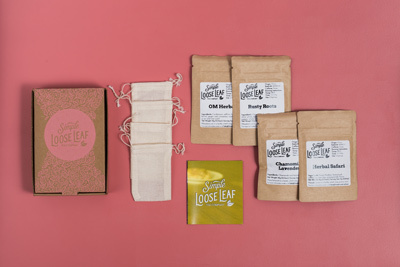 Receive 4 teas, 10 grams of each tea in resealable pouches, along with linen tea filters and information about each tea. Each month receive 2 green loose leaf teas along with 2 other teas that compliment the "bright" flavor pallet common to green tea tea. 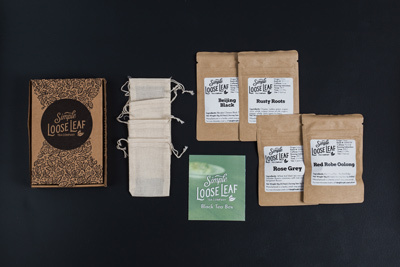 Receive 4 teas, 10 grams of each tea in resealable pouches. Along with linen tea filters and information about each tea. Each month receive 2 black loose leaf teas along with 2 other teas that compliment the "earthy" flavor pallet common to black tea tea.